Louisville Turners Big Top Circus March 22nd - 24th | Louisville, Kentucky | Joe Hayden Real Estate Team - Your Real Estate Experts! The circus has been a traditional family activity for generations and the Louisville Turners will be celebrating the 63rd anniversary of the Big Top Circus this week! Come on out to the American Turners of Louisville at 3125 River Road on March 22nd and 23rd from 7 p.m. to 9 p.m., and on March 24th from 2 p.m. until 4 p.m. Tickets can be purchased online or at Turners now for $10, with children 12 and under available for $5. The day of show prices increase to $10 and $15, and will be available. Founded in 1848 by German immigrants, American Turners has over 60 locations across the United States. The name originated from the German word Turnen, which means gymnastic exercise. The Louisville Turners were created in 1849 and were originally located on Market Street. The very first Turner Circus was held in 1941 as a fundraiser for the students. The performers are all students or previous students ranging from age 2 to adult, and acts ranged from tightrope walking to adult fire twirlers and eaters. 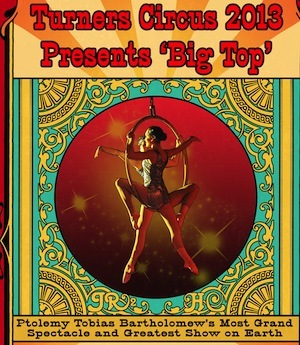 Families looking for traditional entertainment this weekend won't want to miss the Turners Big Top Circus. It will make for a weekend to remember!